Christmas is one of my favourite times of the year but for us Weight Watchers, the joy of the festive season often comes alongside a side helping of guilt at the food we may consume which we usually wouldn’t allow ourselves. Having savvy ways to use up leftovers is not only way the perfect way to keep your portions under control on the big day, but it will also save you a lot of time and money at a manic (and frankly rather expensive) time!! 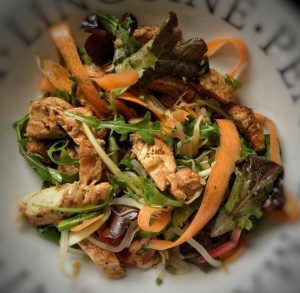 The lovely Asian salad is one of my favourite ways to use up left over Christmas Day turkey. Its packed with flavour and lovely and light and healthy. Best of all, its only 2sp. The perfect Boxing Day lunch! This fabulous recipe was featured in the December issue of Weight Watchers magazine so if you have a copy, you can find it in there too! 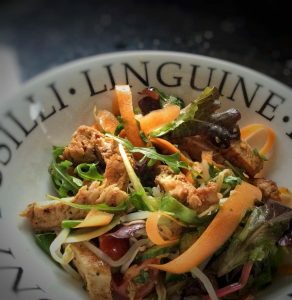 If you fancy making this lovely salad even more filling, you could also fry up some egg noodles and spilt between the bowls for an extra 5sp per person. Spray a frying pan with low calorie cooking spray, heat and add the turkey. Sprinkle over the 5 spice, fry for a few minutes until the meat is heated right through and then add the honey and lime zest. Toss into the turkey, fry for 2 minutes more and then remove from the heat. Blanch the beansprouts in boiling water for 1 minute, drain and refresh under cold water. Pop into a large bowl. Add the rest of the salad ingredients, expect the peanuts, to the large bowl and toss together. In a small bowl, combine the dressing ingredients. Mix until the sugar is dissolved (a minute or so). Then pour the dressing over the salad mix. Share the salad between four bowls, top with the hot turkey and finish with a sprinkle of crushed peanuts. Hi. Could I ask you please, this recipe says that it is for 4 people, but the method says to divide the salad between 2 bowls, which one is correct? Thanks for your time, and wonderful recipes.